How to Easily Master Format ASUS ZENFONE 5 with Safety Hard Reset? Tips and tricks for solving ASUS ZENFONE 5 problems. The ASUS ZENFONE 5 have model name A500CG and A501CG, the different between that model is the process clock speed, but not to much different. ASUS ZENFONE 5 have 5 inches LCD screen with IPS and coated with Gorilla Glass 3 protection. How big is the ASUS ZENFONE 5 camera? 8 megapixel is quite good for taking daily image for documentations. ASUS ZENFONE 5 have dual sim card GSM which active together while standby. So we can received second simcard while we are make a phone-call at first simcard. What is the different between ASUS ZENFONE 5 (A500CG/A501CG) VS ASUS ZENFONE 5 LITE (A502CG) ? Mostly between these two kind of phone has similar specifications, but ASUS ZENFONE 5 LITE only available with 1 GB RAM while ASUS ZENFONE 5 without LITE have 2 GB RAM options. In our opinion, RAM will very important for some kind of users, but for average users, having 1 GB RAM already big enough. The other differences is processor type and some other more. How to Fix or Problem Solving for Recovery ASUS ZENFONE 5 & ASUS ZENFONE 5 LITE (A502CG) hang or not responding or malfunctions or stuck or freezing or bricked ? The 5 inches smartphone with Android operating system will make ASUS ZENFONE 5 user download many applications from Google Play Store, because this phone is good for playing game, entertainment or doing daily office working activity. But please remember, maybe some applications not created with good code or some applications also not compatible with ASUS ZENFONE 5 hardware such as processor INTEL or other hardware specifications. The ASUS ZENFONE 5 will become trouble like hang or stuck or bricks or frozen or boot loop or broken or LCD touch screen not responding. In this situations, we should do force soft reset or force reboot ASUS ZENFONE 5 for deleting temporary files or file caches. If the phone still have same problems, than we should do hard reset or master format. Please always backup all important data before doing hard reset, because all data will be wipe or removed when we do hard reset. Some users also get problems with crash at ASUS ZENFONE 5 while they play games or other similar applications, this is also could happen become the incompatibility of that applications to ASUS ZENFONE 5 processor or hardware, but do not worry because the many applications running well in this phone like Facebook, Twitter, Instagram, BBM (Blackberry Messenger) and many games and other applications as well. If we get crash problem after install an applications, please try to soft reset and run that application again, otherwise we should remove that applications to make our ASUS ZENFONE 5 run normally again. How to Force Shutdown or Force Soft Reset or Force Reboot or Force Restart ASUS ZENFONE 5 & ASUS ZENFONE 5 LITE (A502CG) ? What should we do when ASUS ZENFONE 5 freeze or stuck or hang in the middle of playing games or run application? We should have to force soft reset or force restart this phone. Since ASUS ZENFONE 5 battery is non removable, then we can not force soft reset by open the battery. But do not worry, because we still can force reboot ASUS ZENFONE 5 by press and hold about 10-15 seconds the POWER button until the phone turn off by itself. The other alternative to soft reset or reboot when the phone LCD still work and response with our finger touch, then press and hold POWER button less then 3 seconds then the pop-up menu will appear for Restart / Reboot ASUS ZENFONE 5. This process of soft reset will not remove any important data. The ASUS ZENFONE 5 will continue the step until ready to use in clean factory default. How to Restore and Reinstall Clean Android Operating system / firmware at ASUS ZENFONE 5 (reformat)? When the first time ASUS ZENFONE 5 go to market, the default operating system is Android Jelly Bean. We should have to know, that the clean factory default Android operating system file source is already saved inside ASUS ZENFONE 5 ROM. We do not need to use any computer or download anything when our ASUS ZENFONE 5 OS get trouble or work not normal. We can do reinstall or restore clean factory default Android operating system using hard reset or master format above, then the source file will be reinstall or restore by itself. Please becareful, because this process is the same with hard reset, then all data will be wipe or deleted. How to Unlock or Fix or Bypass or Solutions for ASUS ZENFONE 5 & ASUS ZENFONE 5 LITE (A502CG) forgot password code or security lock screen pattern or pin (lost password)? We better give more protection for our smartphone, so when the phone away with us, nobody can read our important data. Therefore we should give screen lock protection, we can choose whether use screen lock pattern or password pin protections. The problem happen when we can not open the security protection because we forget the answer. What should we do to unlock forgot security protection at ASUS ZENFONE 5? Do not worry, because Android have simple solutions to bypass or unlock forgotten security screen lock pattern or password pin protection using Google account or Gmail account that we already Sign-in when we activate or use ASUS ZENFONE 5 at the first time. This is the steps, please try to give several time wrong answer continuously, after the phone will freeze or locked for 30 seconds. At this time we will find the Forgot Password / Pattern button to help us open the forgotten security protection using Google account or Gmail account. If we can not access Gmail account at this phone, then we should have to do hard reset with hardware button at Option #2 above. How to Improve Performance ASUS ZENFONE 5 (A500CG/A501CG) & ASUS ZENFONE 5 LITE (A502CG) to make run more faster? How fast the speed of ASUS ZENFONE 5? The ASUS ZENFONE 5 use Dual-Core 2×2 Hypre-Threated processor, so we do not have to worry about the speed especially when doing daily activity such as chatting, email, browsing, playing games, watch movie and something like that. Some user have trouble with slow speed when use ASUS ZENFONE 5. As far as we know, this situations happen because there are too many applications run in the background together. As we know when we install some applications from Google Play store, sometime that applications will keep run in the background to wait some command or update Internet data without any notifications. That applications need some memory RAM and processor resources. If too many background applications run together, then the ASUS ZENFONE 5 will become slowly. Try to uninstall some not use applications. If we want to make the ASUS ZENFONE 5 performance speed run faster again like new, then we have to do hard reset or master format. After that we should setup again from beginning. Is That Any Secret Code for Doing Format ASUS ZENFONE 5 (A500CG/A501CG) & ASUS ZENFONE 5 LITE (A502CG) ? There is no secret hidden code for ASUS ZENFONE 5 to make it back to factory default. Do the options above to hard reset it. Problem with ASUS ZENFONE 5 & ASUS ZENFONE 5 LITE (A502CG) Disappear or Remove Google Play Store after Hard Reset, How to Install Google Play Store at ASUS ZENFONE 5 ? Basically there are several type of operating system that are release for several market, the Asus Zenfone family for China release will not have Google Play Store because they have their own applications store for Android Asus Zenfone. Usually the Asus Zenfone for outside China will ship with Google Play Store by default. However, this problems become problem for anyone who need to download applications from Google Play Store. There are several options, one is doing root and install the Google Play Store from recovery mode but this steps is risky because it will remove the warranty and some wrong steps can make our ASUS ZENFONE 5 become trouble and can not work properly anymore. The seconds options is using other Google Play Store similar applications like Moboginie Market Store from http://www.mobogenie.com and download the APK file to your smartphone, after that run it to install the Moboginie Applications Store. How to Improve Battery Life Longer of ASUS ZENFONE 5 & ASUS ZENFONE 5 LITE (A502CG) For Solving Battery Drain Faster Problem (Battery Saving / Extent Battery Life)? Tips for make extent battery life at ASUS ZENFONE 5. With 2110 mAh battery capacity using 5 inches LCD screen will make the battery can not lasting longer, some users need more then 2 times a day for charging their battery. Please do several ways to save battery life of ASUS ZENFONE 5. Extent battery life with turning off some not use features like GPS from Setting > Location, turn off if you want to improve battery life, or choose only appropriate setting for location menu. Turn off Bluetooth from Setting Menu. Turn off Wifi if we are not use it, mostly we forget to turn it off while we are away from Wifi area network. Please setup the Brightness as low as possible. By default the LCD brightness at ASUS ZENFONE 5 will turn auto, so it will adjust base by light sensor. However, we can reduce battery drain by turn off the auto brightness setting and set the brightness as low as we can. More low brightness will extend more battery life. Do not running many applications together, uninstall some not use applications. Chatting or social media applications sometime will received many notifications, the light will blink, the sound notification will play, and the data network will active receiving push notification. Consider to reduce notification or uninstall some not use applications which are always give not important notifications. Please consider to always use internal battery saving mode, but if we need more active data network, then we have to turn it off. If we want to make battery life longer, please use only 2G GSM data network from menu Setting. But it will make Internet data connection more slowly then using 3G. How to Fix Camera Problems at ASUS ZENFONE 5 (A500CG/A501CG) & ASUS ZENFONE 5 LITE (A502CG) ? Why our ASUS ZENFONE 5 camera applications can not start or shoot with blank black screen? Mostly this problems happen because your ASUS ZENFONE 5 camera applications damaged. We can make sure with 2 steps, first try to install 3th party additional applications from Google Play Store like Google Camera or Open Camera or Camera 360 all of them free. Try to capture images with that applications. If that camera apps still not work, then try to use second steps that you have to try doing hard reset to reformat the operating system into factory default and also the camera factory default applications. [Q] Hi, I am using asus zenfone 5. Before 2 days the phone gone off automatically and its not working yet. When the phone get on some msg showing again and again the again get off automatically. My phone showed a mobile shop and the person told that its a software problem and its need to install software. Its gone 2 days the shop staff told me that my phone not connecting to the system, after that they will update software in my phone. Can anyone tell what i do with my phone now. Now i realise that asus is waste phone and company too. [A] Hi, basically when we have this problems, then we will try to reformat your Asus Zenfone 5 operating system using hardware button combination key like steps at #option 2 above. However, if the professional service center has been try but still no luck of success, then maybe your phone get other problems. We suggest to bring your Asus Zenfone 5 to Asus authorized service center to recheck and make sure what is the problems inside your phone. [A] Hi, this problems can be happen because of battery life which already end of life, or other possibilities because of applications trouble. Therefore you better try to backup all important data and do hard reset using hardware button combination key like steps at #option 2 above. This steps will reformat your Asus zenfone 5 operating system to factory defualt, and also remove all bad apps which may do some trouble with it. 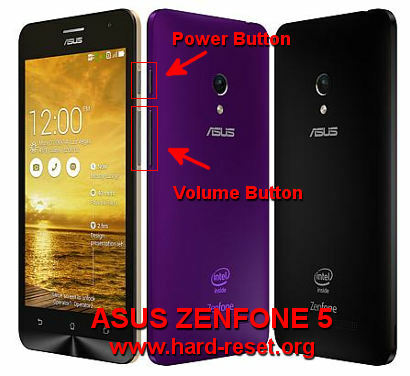 The information from this page describe about how to format asus zenfone 5,Asus zenfone 5 hard reset,hard reset zenfone 5,how to reset asus zenfone 5,hard reset asus zenfone 5,hard reset asus zenfone 4,how to hard reset asus zenfone 5,how to format zenfone 5,zenfone 5 hard reset,how to reset zenfone 5. If you need another resource for hard reset, use search function at this homepage or find from our related posts. How to Easily Master Format HP ELITE X3 with Safety Hard Reset? Hi, at normal situations, you will see recovery menu with options to wipe or remove all data. This will reinstall your Asus Zenfone 5 operating system as well. My Asus engine 5 a 501Cg screen turns blank automatically .. No Function works.. Only power button. Works for switching off… Please give me solution… Waiting for reply. Hi, you have to try doing hard reset with hardware button combination key to reformat your Asus Zenfone 5 operating system to factory default. Hi, please try to reinstall or reformat your Asus Zenfone 5 using hardware button combination key like steps at #Option 2 above. You have to start from OFF conditions. Make sure your Asus Zenfone 5 battery is not empty when you want to recover the firmware using hardware button. After selecting Recovery in bootup menu the option for factory reset is not showing. Any chance to do a factory reset through some kind of microSD download option? Hi, if you do hard reset using correct hardware button, then your Asus Zenfone 5 will show Factory reset menu. Please do it again one more time carefully. Hi, My asus zenfone 5 only going upto asus logo . even power button + volume Up option is also not working . please suggest what should i do ? How can I reset my Zenfone. Hi, if you have try to do hard reset using hardware button combination but your Asus Zenfone 5 still not work properly, then maybe there are some hardware trouble. Please check it at nearest Asus authorize service center. Hi, this problems can be happen because of battery life which already end of life, or other possibilities because of applications trouble. Therefore you better try to backup all important data and do hard reset using hardware button combination key like steps at #option 2 above. This steps will reformat your Asus zenfone 5 operating system to factory defualt, and also remove all bad apps which may do some trouble with it. Hi, I am using asus zenfone 5. Before 2 days the phone gone off automatically and its not working yet. When the phone get on some msg showing again and again the again get off automatically. My phone showed a mobile shop and the person told that its a software problem and its need to install software. Its gone 2 days the shop staff told me that my phone not connecting to the system, after that they will update software in my phone. Can anyone tell what i do with my phone now. Now i realise that asus is waste phone and company too. Hi, basically when we have this problems, then we will try to reformat your Asus Zenfone 5 operating system using hardware button combination key like steps at #option 2 above. However, if the professional service center has been try but still no luck of success, then maybe your phone get other problems. We suggest to bring your Asus Zenfone 5 to Asus authorized service center to recheck and make sure what is the problems inside your phone.